Has it really been six years since the previous “Alice in Wonderland” came out? Oh my God! If you would’ve asked me I would’ve said it’s been at most three years. I remember so vividly the scene where the blue butterfly, Absolem, came “out of the screen” at the end. Time flies so fast. Funnily enough, time is the main theme of this movie, but also a real character. Real in Wonderland of course. A character that speaks English with a German accent. Nice touch, right? He lives in this cool place, where he keeps tabs on people and their time with his little helper seconds and his, a bit bigger helpers formed by seconds obviously, minutes. It’s 1875 and from the very beginning we get a very different, but fitting and expected sight of Alice: she’s a captain now of her own ship and she proves to be a great and respected leader for her crew. She wants to sail the seas of the world and live the adventure, but funding stops and her mother also wants her to stop and just settle down and have a family. But mundane issues will have to wait, as Alice is summoned once again in Wonderland. Her task is seemingly much harder this time around as one of her best friends, The Mad Hatter, is in great danger. Alice must do something very important for him in order to save him and put things on the right track. At first, even Alice thinks that what the Hatter asks of her is impossible, but in true fairytale fashion things turn out to be much more possible than initially believed. As is said in the trailer, saving the Hatter is only a matter of time. Alice will have to make use of time in an uncommon way to put the pieces of the puzzle, she has to solve, together. But with time not being on their side, literally (I already told you that time, here, is a true character), Alice and her Wonderland squad are in a real race against him/it. While there are many puns and jokes regarding time, with a couple of minutes dedicated specifically to make fun of it/him, we are also shown how serious the matter is. I think the scene where we are shown how someone’s clock is moved to another chamber as it stops and Time says “I hope you used your time well” will strike a chord in many of us. In spite all sadness and feelings of regret we might feel regarding the way we manage our own time, what’s also worth mentioning is how obvious it is that Alice wants to stand as a role model for girls: the way she is headstrong, does not give in or give up for that matters or what her heart wishes and she wishes to do for her life. How brave she is facing all the horrors that Wonderland holds for her and how dedicated and loyal she is to her friends and how she would try literally the impossible to help them. 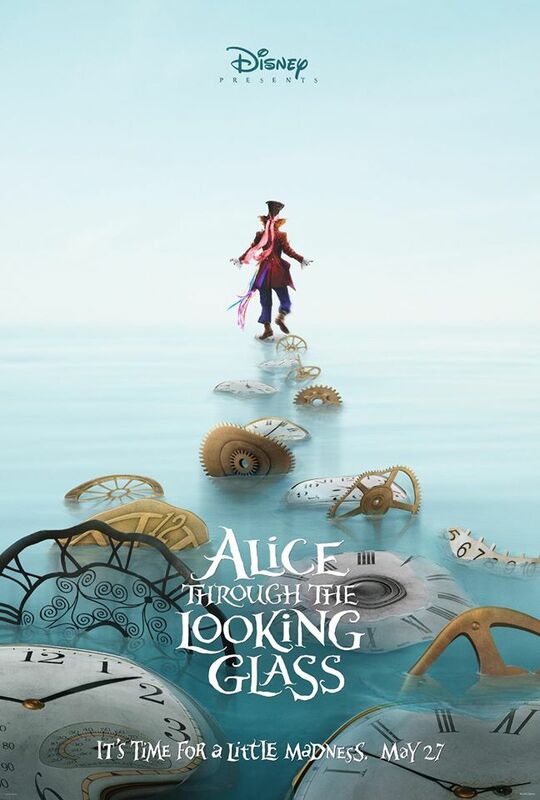 I enjoyed “Alice through the looking glass” very much with its odd characters, various themes and heartfelt story. I enjoy how it so efficiently transports you into Wonderland and gets you wrapped up in its atmosphere and also how it gets you attached to its quirky characters. Mia Wasikowska does a great job yet again as Alice being equally charming with her cute smile and determination to bring peace for Wonderland’s inhabitants once more.